Winter Olympic Games for Kids: 8 Ways to Get in the Game at Home! The 2018 Winter Olympic games are coming up and what better way to celebrate them than having your own olympics games for kids at home. These games are perfect for the whole family and best of all, they can be done inside and outside. 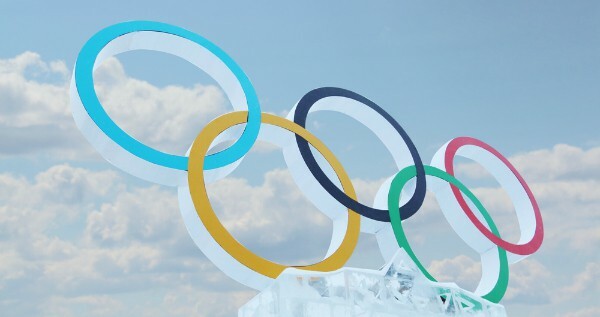 The Winter Olympic games will be held in Pyeongchang, South Korea on February 9th, so you have just enough time to grab a few last-minute items for your own winter Olympic games. Here are some fun workout ideas for the whole family and 22 ways to get your kids active TODAY! If you are inside, take some different colored or patterned tape and cut 5-7 pieces about 12 inches long. Place them on the floor laterally and space them 12 inches apart. Have each person test their long jumping skills by starting at the same end and seeing who can go the furthest! Want to take it outside? Try using chalk! No matter what the weather is, you can still enjoy the olympic games. This simple DIY is great for the whole family, including those little ones just learning hand eye coordination. Take a paper plate and glue it to a sturdy base to make it resemble a racquet. You could use something like a paper towel roll or paint stirrer! Then blow up 1 balloon for every 2 people and get the game going! You can keep score or first one to drop loses. Before you and the family get ready to watch the winter Olympic games, grab those bottles of beverages and set up a ring toss. You can use glow sticks necklaces, pool rings or make your own from paper plates by cutting out the inside. *** BONUS** Paint the paper plates the official colors of the Olympics. Take out those old pool noodles and put them to use! Let your kids use them as a balance beam to practice their balance and bring out their inner Olympian. Another great use for those olde pool noodles are using them as javelins! In a spacious area, create a bullseye on a piece of paper and tape it to the wall. Then using the pool noodle, try to hit as close as you can to the center. Make sure you move anything breakable out of the way. All you need for this DIY is straws, cotton balls and tape. Use some tape to make a rectangle on two opposite sides of your table and one long strip to divide the table in half. Then, using a straw blow the cotton ball into the opposite rectangle to score a point. This is something that we have all attempted at one point or another growing up. Turn up your favorite tunes, slip on some of those fuzzy socks and start your routine. Have your kids create their own routine or make one up with their siblings. This is a one item DIY that is sure to bring out your inner Olympian! In a hallway, grab some toilet paper or streamers and tape them to each wall in different angles. Make big enough spaces to climb over or under each piece. Time each other to see who can make it through the fastest. I hope you enjoy these winter Olympic games for kids. Let us know which ones you try!